That was one of the key lessons that Congresswoman Tulsi Gabbard (D-Hawaii) shared with members of Rights & Democracy (RAD) and the Monadnock Progressive Alliance (MPA) at our recent co-hosted, bi-state gathering. We see her as one of the boldest progressive leaders in the country who is standing up against powerful elements of the establishment to do what is right—from joining a veterans delegation in solidarity with the Standing Rock Water Protectors trying to stop the Keystone Pipeline in North Dakota to when she resigned as Vice Chair of the Democratic National Committee in early 2016 to endorse and support Senator Bernie Sanders in his run for president. Here are some of the lessons I took away from Tulsi’s moving keynote speech and conversations she had with dozens of us throughout the day at the RAD Members’ Assembly and MPA’s People Power Summit. It struck me that this was not only a warm greeting, but an important grounding for a way of life. Imagine what would be possible if each one of us and our collective movements can come to each other and our communities is this sort of deep respect and recognition of our interconnectedness. While this may seem daunting given the level of division in our country and on our planet, it would be powerful if we could work to embed this concept in how people see and greet each other. Building off of this concept of ‘aloha’, Tulsi encouraged us to lead with love and stay away from the ‘Us versus Them’ mentality. I was listening closely, because in my introduction of her I shared some analysis of the political challenges we face and focused considerably on the destructive impact of the Koch Brothers and fellow radical billionaires. While she recognized that this is what we are up against, she made a powerful case for focusing our conversations on how the solutions we seek ultimately benefit everyone and are about caring for one another. 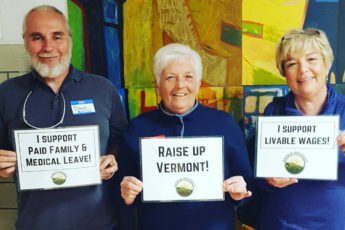 How we can ensure clean drinking water, clean air to breathe, livable wage jobs, health care for all, high quality public education impacts everyone, no matter how they are labelled. This past year I have been studying the strategies of our opponents from their use of strategic racism in Dog Whistle Politics by Ian Haney Lopez, to their strategies of using their enormous wealth to take over every aspect of the government in Democracy In Chains by Nancy MacLean and Dark Money by Jane Mayer. While I think it is important for us to all understand how dangerous it is what they are doing the lesson from Tulsi was to lead by telling the story about the positive future we can have if we come together. 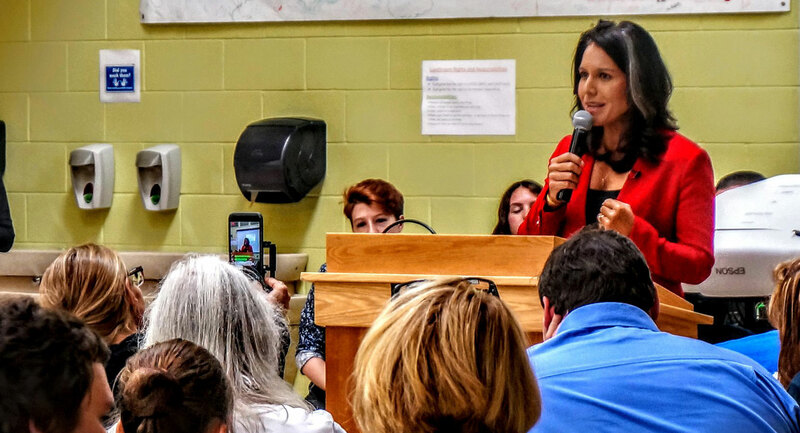 As social media algorithms are used to drive deeper polarization in our communities, Tulsi reminded all of us how it is important to have a positive and accessible movement that demonstrates how love can triumph over hate and greed. A core part of her message was what that while we have this positive conversation about the things are communities need, we also must connected to a movement for peace. This is a critical point too often missed by the left, that for all the talk locally about taxes we fail to connect that the massive amounts of military spending comes at a direct expense to the wellbeing of our communities. As I have thought about this message in the work that we do at Rights & Democracy, I believe more and more that as we head into these critical next set of elections, we must connect the dots as Tulsi says and this must be part of building a new social contract that recognizes our interconnectedness and is focused on what it will take for all of us to truly thrive. It is why it’s so critical that RAD be a member-driven and member-funded organization – that can chart it’s own path in a world that needs this kind of movement building work now, more than ever. Congresswoman Tulsi Gabbard fueled all of us at the RAD Membership Assembly with a tremendous amount inspiration in our hearts to meet the challenges ahead. Who can help build a People Power Party and be a house party host in the coming weeks to get our friends and neighbors involved in the upcoming election? Email me at james@radvt.org if you want to learn about hosting a house party.